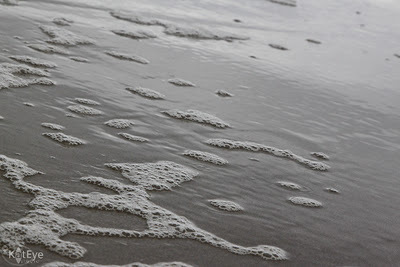 I’m over at Mortal Muses today, musing on “warmth” with a vision of the sea. I thought I would share another image from that same day here. One perfect, sunny, warm day on Santorini Island in Greece last spring. I’m feeling better today, but I don’t think it will be too long before I’m crawling back to bed for a nap. I’m still not 100%. Thanks for the virtual comfort sent yesterday in the comments. I appreciated them all! Yay! It’s Exploring with a Camera day! After a week off exploring in Chicago I’m ready to explore with you all here on the blog. 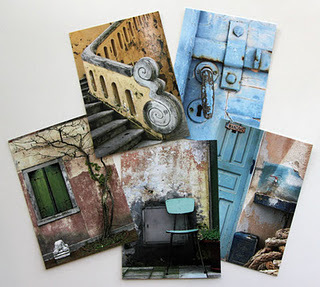 Today we’ll be diving into Found Texture in our images. At the end of the post you will find a link up to share your explorations of the topic over the next two weeks. There is a giveaway going along with this too! Keep reading to find out more. It is no secret that I love texture in my images. 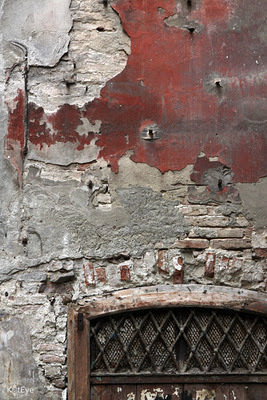 I remember when I first started capturing images of texture for texture’s sake in Italy. 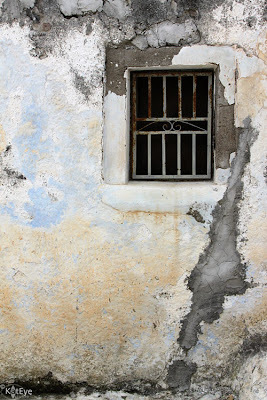 I didn’t know what was going on, why I was drawn to capture images of peeling paint. It made no sense to me at the time! Now I know… it’s all about the texture. In this exploration, we will be focusing on Found Texture, texture that is already existing and captured with your camera, not added texture in post-processing. Adding texture layers in post-processing is a popular and very fun way of changing your image, but that’s not the focus of this topic. By my definition, a texture is found on the surface of a form. (Form is the representation of a three-dimensional object. If you’re not sure what I’m talking about, visit the past Exploring with a Camera: Finding Form post.) Here’s an example to help: Consider an object in the shape of a sphere. 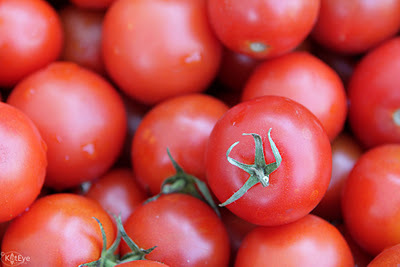 The sphere is the form, but the surface of the sphere may be smooth, like the tomato shown below, or rough, like the orange. 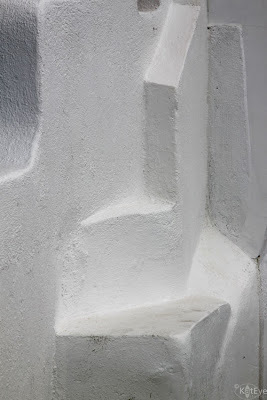 If you are struggling with the concept of texture vs. form, think of this way: If you can imagine an object to have a different surface texture, but the underlying form of the object stays the same, you are distinguishing texture and form. The surface holds the texture, and the texture gives an additional dimension to our photographs, making us want to reach out and touch. Even though we can’t physically touch the objects in an image, in our imagination we can. Texture adds a tactile nature to our experience of a photograph. We know what smooth feels like in real life, so the sensory experience of smooth is added to our experience of a photograph. The texture can draw us in as a participant in the image. Texture is not only on the surface of forms in our images. 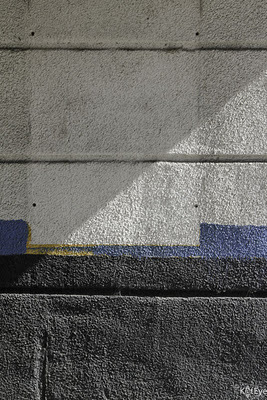 Something large and flat serving as the background of the image, such as the wall in the lead-in photo, is also a surface that can have texture. 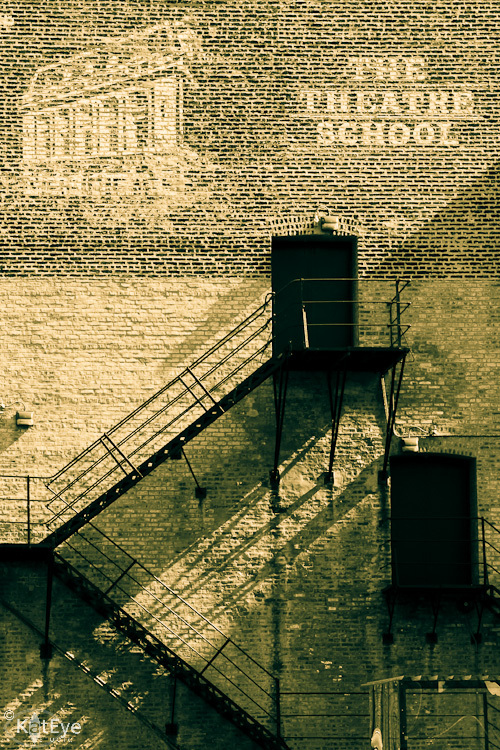 In the case of the photo above, from Chicago, you see the texture of the brick. How many types of texture are there? Let’s see if we can make a list… smooth, rough, gritty, sticky, crumbly, bumpy, velvety, leathery, prickly… add yours to the list in the comments below. We can capture all of this texture and heighten the sensory experience in our images. When you start to notice it, texture is everywhere! Nature is a great source for random texture. 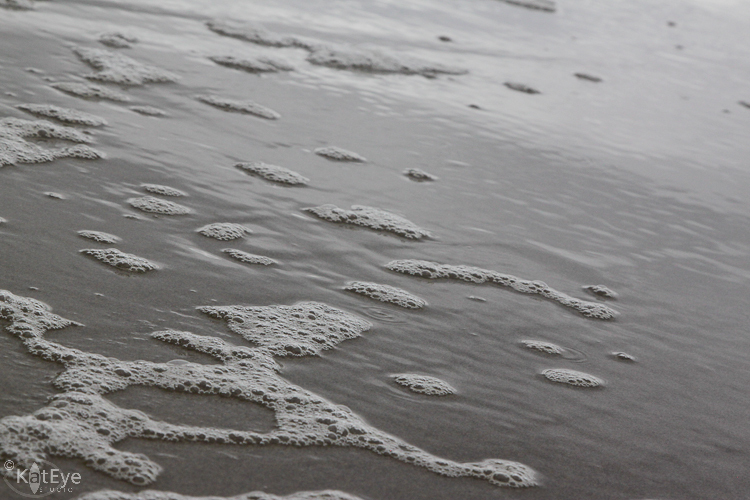 Since my subjects tend to be in urban environments, I looked for natural texture while camping at the beach a couple of weeks ago. 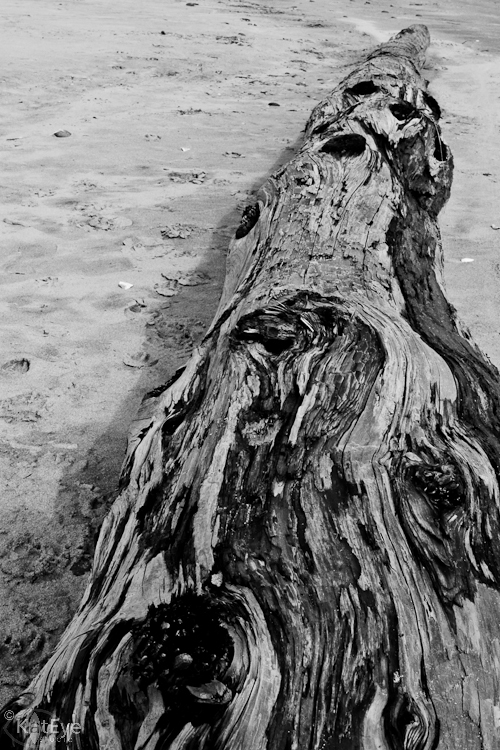 I found everything from the glass-smooth texture of the receding waves, to the rough-yet-soft texture on the trunk of a tree. Humans have learned from nature, and covered our man-made world with texture. Some of it is purposeful and functional, to hide flaws in a wall joint or increase traction in a floor. Some of the texture comes as part of the process, such as in bricks. Some of the man-made texture in our world is purely for artistic beauty. The texture in the floor tiles below was created to be both artistic and functional. The one thing I’ve noticed, however, is that man-made texture doesn’t have the same randomness as nature. Humans like patterns and processes, and our created textures usually have some sort of repeating pattern. Sometimes it is obvious, as in the floor image above, and sometimes not so obvious. 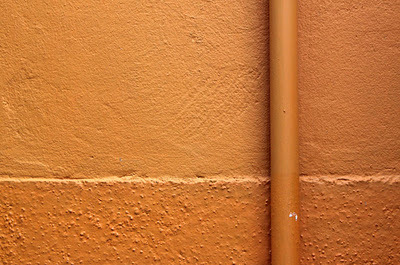 Consider the texture that may be applied to a wall, there is a limit to the size and depth of the bumps you find. There is some randomness within the texture, but the overall texture is controlled. When you add nature, in the form of time and weather, acting on the mad-made texture you get more natural randomness. I think that’s why I, along with so many other photographers, like to photograph “urban decay.” The added elements of time, weather and neglect increase the random texture in the images of everyday objects. It adds dimension and interest. Now that you’re seeing texture everywhere, what is the best way to capture it? As in capturing form, texture will appear differently in different light. Bright sunlight will create stronger shadows and light/dark highlight of texture, while shady or diffused light will create more subtle highlights of the texture. 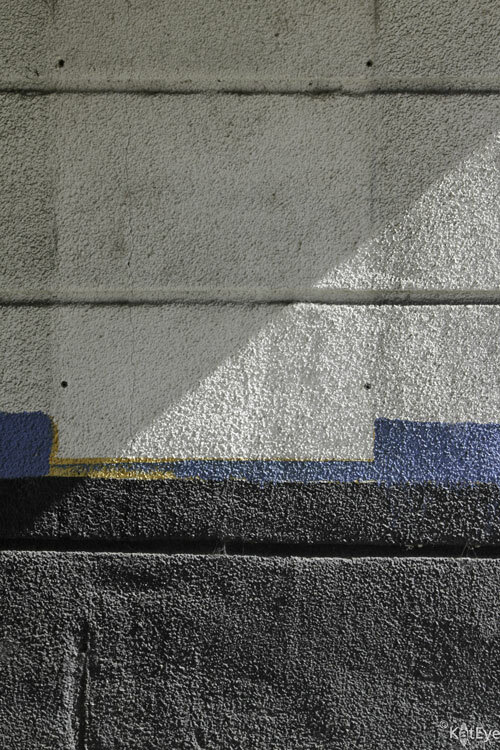 This wall below, found in Chicago, is an interesting study of light and texture since it’s both in sun and shade. You can see how the sunlight enhances the texture. You can see a similar effect in this image from Greece as well, as part of the wall is in sun and part is in shade. 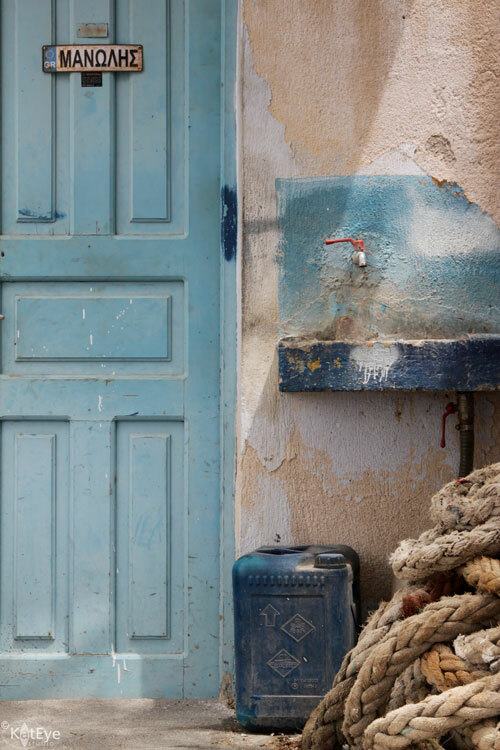 There are multiple textures in this image from more than just the light, however, with the texture of the wall, rope and door adding to the tactile nature of the image. 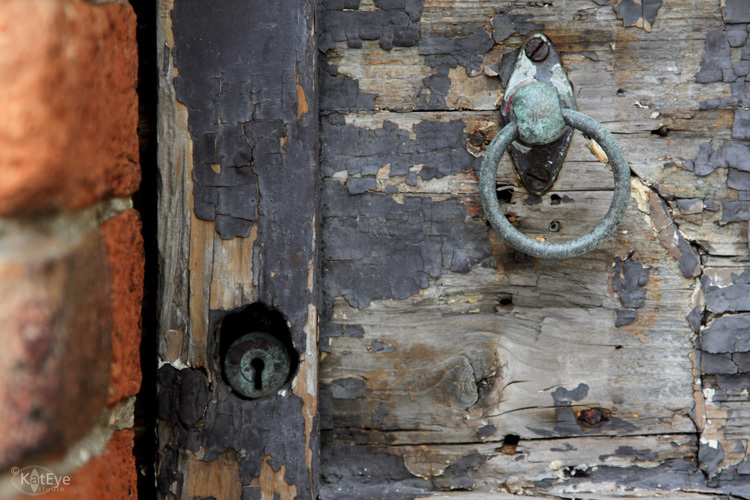 Along with light, color has a great impact on how we perceive texture in an image. Texture can be enhanced or overwhelmed by color. Color is useful to highlight texture when the light is non-directional or the texture is very subtle compared to the overall subject being photographed. In the case of the staircase in Portugal, the light is very diffuse so the texture of the wall is communicated by the color gradation. You can still “see” the texture, through the color variations. 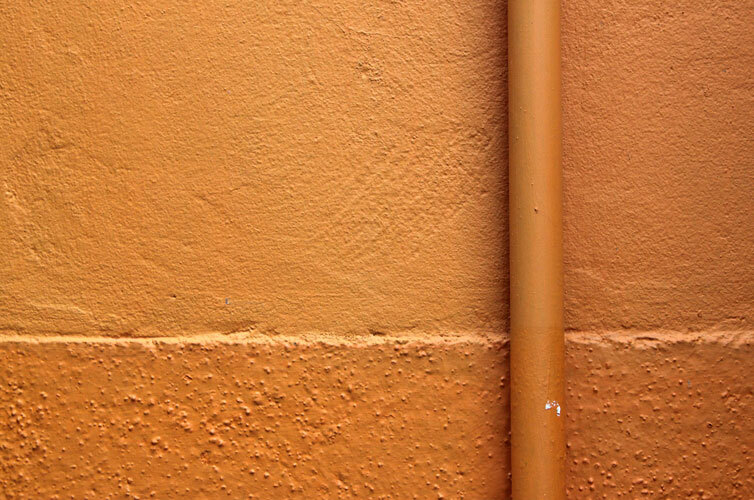 Color can also dominate to the point that texture recedes in terms of visual information. Consider the image of the oranges shown earlier in this post. What do you notice first? Likely, the complementary color is the first thing you notice. 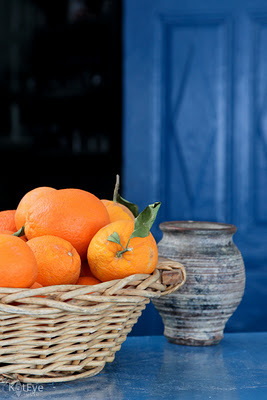 The texture of the oranges, basket, vase and table are noticed second. To highlight or study texture, working with monochromatic images can help. The image of the driftwood below, converted to black and white, further enhances the texture of the splintery wood. The range of tones from light to dark are what provide the texture information, since the light is fairly even. 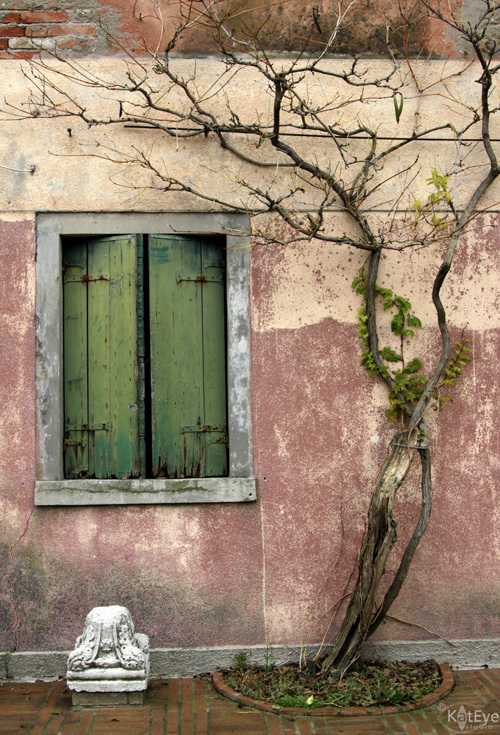 The image below from Burano has color, but it still monochromatic. This allows the form and texture in the image to be the subject. While diffuse, the light is still directional and highlights the texture and form. Now that you are thinking of what texture is, where to find it and how to capture it, let’s look at a few different ways of using texture in images. One way of using texture is to capture it as the subject. This wall in Bologna was so interesting, I captured it just for the texture. Layers upon layers of different textures are visible. The same with this wall in Greece, texture is the main subject. In both cases, I’ve included an architectural element to help ground the image in reality, but that is not necessary if you are capturing texture for texture’s sake. Textures create great abstract images. Often, I find that I use texture as the “backdrop” in the image. The lead-in photo is one example. 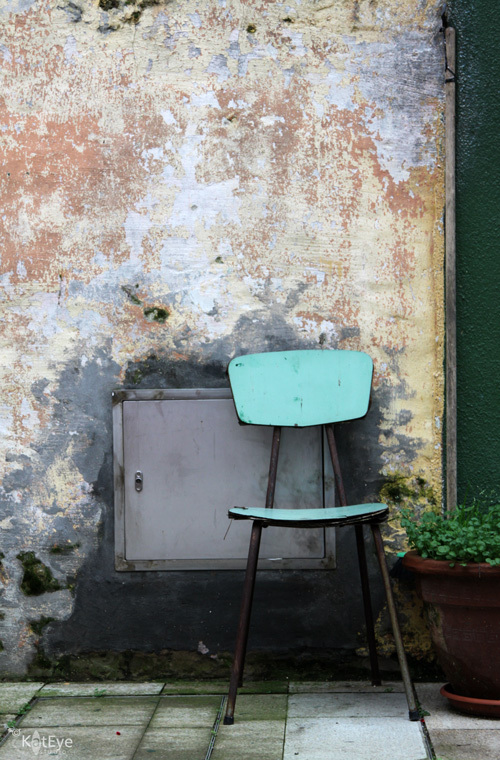 In the case of this scene in Burano, the texture of the wall is a backdrop for the scene with the chair and pot. This textured wall in Torcello is the backdrop against which the tree, window and architectural fragment are arranged. The wall is not the subject, but the texture enhances the interest in the image and ties the elements together. 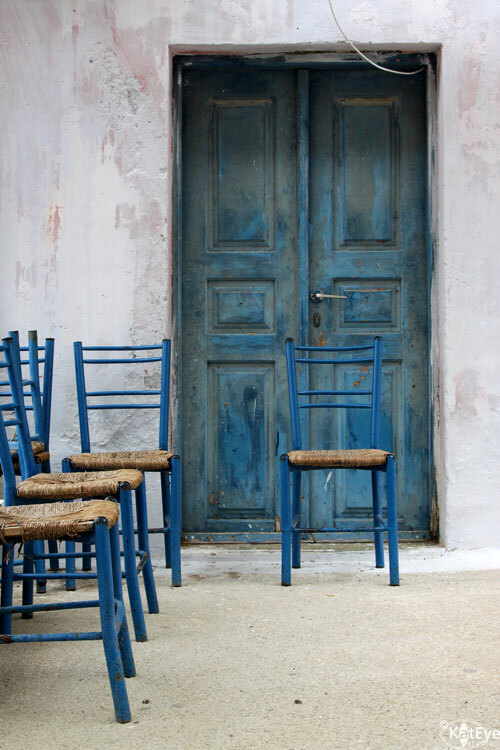 Creating contrast with texture is a great way to increase the interest in a photo. 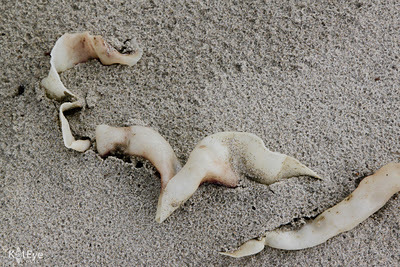 In the image below of the sea weed at the beach, the gritty sand contrasts with the smooth, rubbery surface of the sea weed. 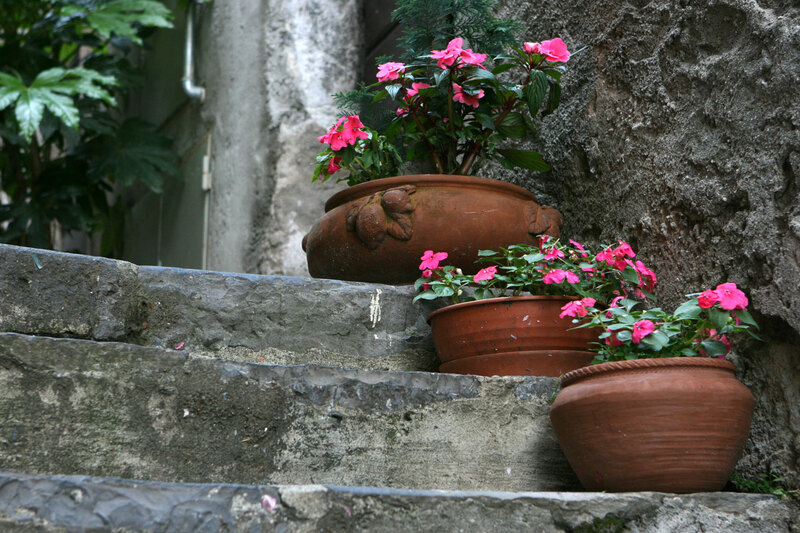 The worn walls and steps contrast with the smooth, round pots, both in color and texture, in the image below from Varenna. The color and texture contrast, along with the lines of the steps, draw your eye directly to the pots of pretty flowers. 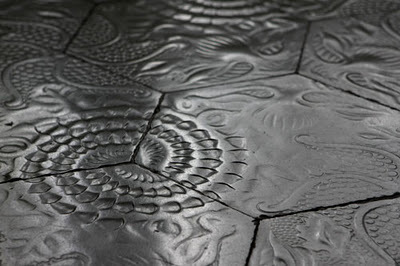 What: Texture is found on the surface of form, and gives a tactile dimension to images. Sources: Nature, man-made and aged-man-made objects and surfaces are all possible sources of texture. 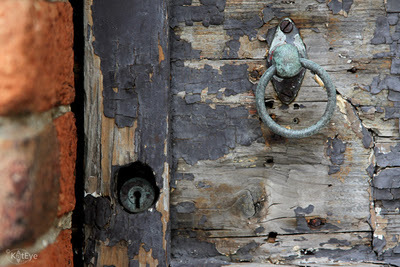 How: Light along with color (presence or absence) and tone can be used to convey the texture. Ways to use: Texture can be the subject, a backdrop or used for contrast in an image. 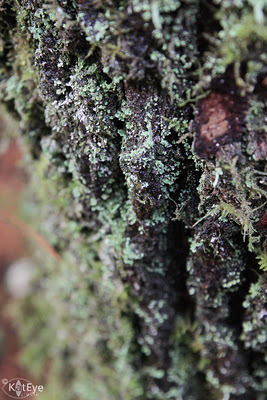 There is so much more to texture, I look forward to learning from you as you share your images! You can link in below, the link up will be open through 3-November. As an added bonus, I am giving away a set of my “Texture” postcards! When you link in your texture image, you will be entered in the drawing to win. I’m heading out for a few days, and my presence here will be a bit sporadic while I’m gone. 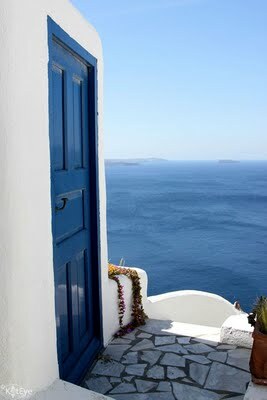 Unfortunately, not to the Greek Isles this time (isn’t this place dreamy?) but I’ll find some equally interesting things to show you while I’m gone. I hope you all have a wonderful weekend, see you soon! I’ve Found my Eye, how about you? Here it is, a quintessentially Kat image. 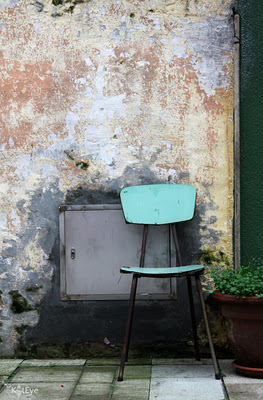 It’s got color, texture and is a scene that shares the spirit of place. It’s the beauty that exists in the everyday world around us with no intervention. This image is from the port of Fira, on Santorini island in Greece. It’s at the bottom of the long path that the donkeys and their handlers take, carrying people up and down the steep hillside between the town and the port. It’s where the handlers sit and chat, but they were elsewhere at this moment. Perfect for me. So many good things have come out of my time in Italy, and one of the absolute best has been finding my “eye” or photographic style. I was never so empowered as when I finally cried, “Yes, this is me!” I realized I am an artist, I have a voice and a vision to share with the world through my photographs. Maybe you’ve been photographing for a while and you love it, but you wonder if you have a “style” to your photography. Maybe you see glimpses of your “eye” in your images, but find it elusive. You read interviews with photographers saying you have to find your own style. But how? The Find Your Eye: Journey is here to help! Instead of teaching you the technical basics of your camera or photo processing, this course series enhances the personal expression and creative connection you find in your artistic practice with photography. We start the series off with the two week Starting the Journey foundation class where I’ll introduce you to the basic tools and exercises used throughout the course series. You’ll set up the tools of photojournal and inspiration file, then use them for the photojournal prompts and eye development exercises which help you look within as well as explore the world around you. By the end of this short course, you’ll have a good start on recognizing your eye and you’ll have the foundation you need to take any of the other courses in the series. Starting the Journey is a low time and money commitment, why not try it out and see if you want to continue the journey to Find Your Eye? Registration will open in early July. See FAQ for logistics information. Once you’ve started the journey, you are ready to explore new horizons and deepen the understanding of your style. The four week Find Your Eye: Journey of Recognition class continues with photojournal prompts and eye development exercises, all designed to help you dive more deeply into experiencing the environment around you as well as understanding what calls to you. By the end of the four weeks you will have developed a much greater sense of your own unique photographic style. Along the way you’ll have a fun, nurturing community of classmates from around the world to help you learn, share and grow your creative expression. You will be able to register for both Starting the Journey and Journey of Recognition together for $83. That’s a 15% savings over registering for each course individually. Your registration gives back! 10% of all registration fees will be donated to a great cause. I’m excited to once again support Nest, which has the wonderful mission of helping women in countries around the world make a living wage through traditional arts and crafts. Not only do you get to learn something new, you get to support others. How great is that! Have questions? Drop me a note kat [at] kateyestudio.com and I’ll answer them for you. [The photojournal prompts are] not something I would have done on my own, but now it’s something I look forward to doing. I think journaling and writing is an important part of learning about ourselves as artists. I liked how [the eye development exercises] got us looking at different things and trying new subjects. I can tell a lot of effort went into this on your end. It was well thought out and well structured. — Marji T.
My favorite thing about the course was seeing the photos and reading the words of teacher and participants. It was helpful to see different styles, interests, perspectives… and to know a bit about the photographer (at this time in her life/photo journey). I felt encouraged… never ignored… even though my experience was limited and my equipment less advanced than others. — Sharon B. See more student comments here. Sign up for the blog newsletter (on the sidebar) to be the first notified when registration opens! 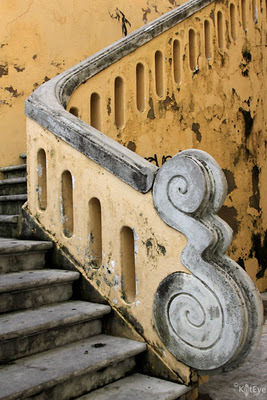 Since starting the Exploring with a Camera: Finding Form prompt I’ve been seeing form everywhere. I’ve realized that much of the art I love outside of photography, both painting and drawing, relies heavily on form. I love the shading of light and dark, how something so simple creates dimension on a flat surface. 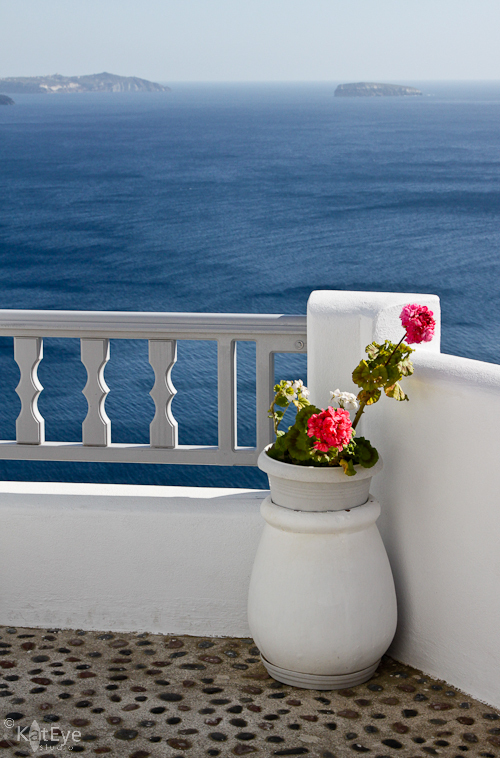 You can see that in this photograph from Santorini – it’s all about form. If you didn’t have the light and dark, the various shades, what would you see? Just a blank white rectangle. Since I’m off traveling this week, you have a bonus week with this exploration topic! Link in below or share your image in the Flickr pool, if you’ve found form in your photographs. I’ll catch up with comments next week when I get back. In the meantime, you can fill my void and visit the links of your fellow participants, and see how they are Finding Form in the world around them. Sometimes, as we travel through life, it may seem that we are the only ones with problems. The only ones who feel fear. We may read the stories of these big successes, people we admire, and think, There’s no way they feel like I do. We tend to look at the outward positive things and tell ourselves a story, when we can’t see the fears that are inside of someone else. I feel fear. As I start to dream big, after the creative retreat I attended a couple of weeks ago, my fears are growing to match. I recognize now that my fears have accompanied me on every step of this creative journey. Fear of sharing my work. Fear of putting my honest self out here on the blog. Fear of trying something new. The only way I’ve grown is to face the fear and move past it. The bigger the steps we take on our creative journey, the bigger our fears become. Last winter, as I was getting ready to start my first run of the Find Your Eye class, I was assailed with an attack of, “Who do you think you are?” Who did I think I was, to create a class and put it out there to the general public. To think I had something to contribute to the conversation, since I don’t have a photography degree or years of professional experience under my belt. Luckily, it was too late – the class was being advertised, people were registered – I was committed and couldn’t quit. It didn’t mean I felt those fears any less, however. We all feel fear. Fear of rejection, ridicule, failure, hurt. Maybe even fear of success. Fear is there to protect us, to keep us from getting hurt. Everyone has doubts and insecurities. The face we put out to the world may be a brave one, but I guarantee there is some fear going on inside. We are not alone in this. While it may be a comfort to know others feel fear too, it doesn’t make it easier to deal with our own fears. The only way I personally know how to deal with fear is to acknowledge it. If I can define the fear, understand where it is coming from, I can make a plan to deal with it and move ahead anyway. If I can name it, I’m less likely to let it stop me. The fear doesn’t actually go away, I just carry it along for the ride. I think of it as having a conversation with my fear, “Hello there Mr. Fear. I see you lurking there. I see what you are trying to do. Thanks for trying to protect me, but this time I’m not going to listen to you. We are moving ahead anyway. You can come along with me and see how this turns out.” Somehow, that helps. But believe me, it’s not comfortable, to carry this fear along. It would be easier to run away in the other direction. Now, as I get ready to hit the submit button on this post, the little voice of fear is talking in my head. Should I admit my fears publicly? Won’t this just look weak? Maybe it will to some of you, but to others, it might bring a sigh of relief. You aren’t alone. What do you do when faced with fear? How do you recognize and address it? Move past it? Please leave a comment, and today let’s help each other deal with fear.